Nowadays homes are required to have smoke alarms. Every day you walk by these in your home and you tell yourself you’ve done your part to keep your home safe . . . but have you? In the United States 1 out of every 5 home fire deaths was in a home with a smoke alarm that did not work. 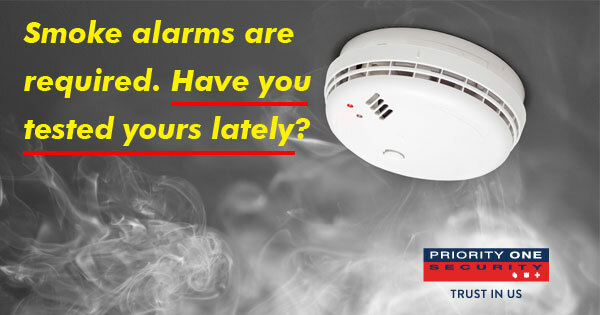 All of us at Priority One Security strongly advise you to take the next step and, instead of walking by the smoke alarm, stop and test it. You should do this every month! Yes, every month! 1. Find out what kind of smoke alarms you have. There are battery-operated, AC-powered units and Monitored Smoke Detectors. Battery Operated are inexpensive yet if you are not home you can not hear the alarm. They also require frequent inspection to determine the condition of the battery. AC-powered are installed by a professional and use a direct-wired power source. But they still need an independent battery backup. Again, if you are running errands the alarm is not protecting your home. A Monitored Smoke Detector is supervised by our UL Certified Central Station and can monitor your home 24 hrs a day. If your alarm goes off while you are out we will be notified immediately keeping your home and pets safe. When seconds count, have a monitored fire alarm system. 2. Now you know the different types of detectors and each one must be tested monthly. Press and hold the test button on the smoke detector. It can take a few seconds to begin, but a loud, ear-piercing siren should emanate from the smoke detector while the button is pressed. If the sound is weak or nonexistent then replace the batteries. If it is still not working then you replace the unit with a functioning smoke detector or contact a professional to discuss the best detection options for your home and family. Contact Priority One Security to talk with a highly trained technician to learn more about solutions for your home and family. Call 888-407-SAFE.